Welcome back! This week’s author interview is with the very talented Daniel Braum. 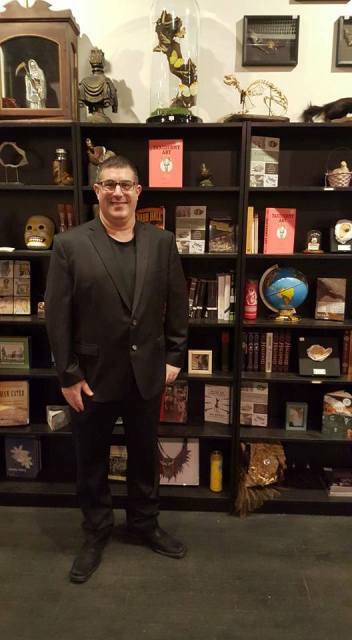 Daniel is the author of numerous books including The Night Marchers and Other Strange Tales from Cemetery Dance Publications, The Wish Mechanics from Independent Legions Publishing, and Yeti. Tiger. Dragon. from Dim Shores. Recently, Daniel and I discussed his inspiration as an author as well as his forthcoming projects and advice to new writers out there. I came across the short stories of Lucius Shepard and Tanith Lee on the shelves of one of my local libraries as a teen. They are both favorites of mine and writers that continue to inspire and influence me. I also read Salinger’s and Stephen King’s short stories as a teenager. Both had a big impact on me. Later in life I came to the work of Hemingway, Tim Powers, and Kelly Link. I think their work is masterful. Only in the last few years I became aware of the stories of Robert Aickman. This was an important milestone for me as I discovered that my work “fits in” best with his lineage of strange tales. This year thanks to and on the recommendation of author Scott Nicolay, I read my first few Tiptree stories, the Quintanna Roo ones. These stories have been very much on my mind. I don’t remember ever deciding to be a writer. Making the decision to attend the Clarion Writers Workshop in 2002 and to follow through with much of what I learned there is likely the best answer I can give to that. Your work seamlessly blends elements of fantasy, science fiction, and horror. Do you remember your first exposure to speculative fiction or films? What drew you to more fantastical worlds as a writer? As a child my Dad would tell me about the movies he would see that I wasn’t allowed to watch. He would also tell me and sometimes draw for me what I called “monster” stories. As a teen, one summer my Mom grabbed a copy of Stephen King’s “The Stand” off the supermarket check-out paperback racks for me because she knew I liked to read. I was lucky because in my experience the speculative had always been lumped together and a part of “fiction”. I didn’t grow up with genre distinctions. I was aware of them but only really learned of them as an adult. I don’t remember being drawn to writing the fantastic. The fantastic always was such a big part of the way I conceptualized fiction. I figure this is a good a reason as any as to why “the fantastic” is a major part of the stories I write. A relatively early exposure to the work of authors Tanith Lee and Lucius Shepard are also likely a big part of this. In Tanith Lee’s stories anything can happen and often does. Her settings range from the here and now to other dimensions and other planets of her own unique imagining. Her characters are men and women and beings of every shape, size, color, and gender and from every background. This was the norm and default position for me before I even knew of the politics or even ever gave the notions that go along with this a second thought. Lucius Shepard captivated me with his Central American settings. Much of his stories presented a unique sense of wonder (and horror) in the here and now, even if often that here and now was the “far away” places of Central America. Both authors presented unbridled worlds of imagination that were not only fun they had so much more going on at face value and beneath the surface. Wanting to do the same in my work was always a given. 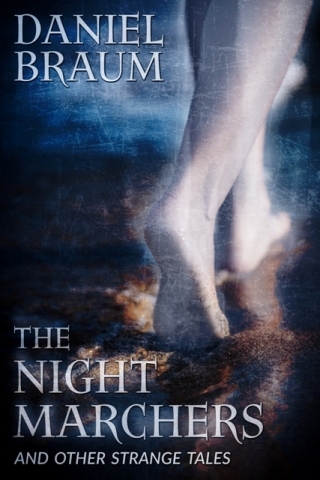 Your debut collection, The Night Marchers and Other Strange Tales, came out in 2016. What was the process of putting together the table of contents for the book? Were there any stories that you were planning to include that ended up being cut, or any pieces that were last-minute additions? Additionally, did you curate the order of the stories to express a certain theme or mood? The stories for the Night Marchers were written over 15 years and appeared in publications ranging from Kelly Link and Gavin Grant’s Lady Churchill’s Rosebud Wristlet to Cemetery Dance Magazine. Some of the stories appeared in the now defunct zines Electric Velocipede and Full Unit Hook Up which both published interstitial material that crossed genre boundaries. When the book was acquired by my editor Norman Prentiss for Cemetery Dance the only requirement was that it contain the three stories that had first appeared in Cemetery Dance Magazine, “Across the Darien Gap” (from issue #54 in 2006), “Jellyfish Moon” (from issue #67 in 2012 ), and “The Green Man of Punta Cabre” (from issue #71 in 2014 ). Once I had the stories chosen for the Night Marchers I worked on the sequence. Factors such as mood, theme, tense, and other factors came into play. I don’t read collections in order of the table of contents and I’m aware not everyone does. I like that the stories in the book can be read out of order and still feel like they are of a kind and of a set. One story that was initially selected for the project did wind up being “cut”. The story is called “Tommy’s Shadow” and it first appeared in the print zine Kaleidetrope. The story received strong, positive feedback from some authors and reviewers who were reading an early in-progress draft of the book. So when my editor suggested that I select a story and make it “exclusive” for trade edition “Tommy’s Shadow” was eventually selected. But it turned out when I sold the rights to the trade edition, the trade edition publisher did not connect with the story in the way everyone else had and had reservations about including it in the trade edition. The solution was that a story I had just completed “A Girl’s Guide to Applying Superior Cat Make Up and Dispelling Commonly Found Suburban Demons” was included instead. “Tommy’s Shadow” is a story I love and one that goes over well with audiences when I read it, but the timing and series events led to it not making it in to these editions. “A Girl’s Guide” went on to be well reviewed and reprinted in Great Jones Street project. I read the story at the Night Marchers book launch party at Morbid Anatomy Musuem and is one audiences enjoy when I read it. I’m taking a different approach to the collections I’m working on now. I have a few collections in progress and groups of stories I am working on with the intent of the stories being presented for the first time together in the collection. This is something I’ve never done before and lends to a very different creative approach. Also in 2016, Dim Shores released your limited edition chapbook Yeti. Tiger. Dragon., which features a trio of tales that deal with cryptozoology. What research went into crafting these particular stories? Also, since the book is now out of print, do you have any plans at this time of releasing the tales elsewhere, perhaps in another collection? For those new to the publisher Dim Shores Press publishes small run limited editions of illustrated chapbooks and collections. It was a great experience working with publisher Sam Cowan and thanks to a robust pre-order from Dim Shores subscribers and a well-attended launch party all 150 copies of the book sold out in 5 days. I don’t think of myself as one of those writers who revels in the research aspect of preparing to write. The three stories in Yeti Tiger Dragon involved very specific knowledge of place and setting and of crypto-zoology but most of what I needed to know to write the stories were things I already knew or “researched” as a labor of love. So I had already done the research when it came time to draft the stories. So while I don’t have a lot about research to share, I do have a few fun fact that relates to the book. The first story “The Yeti’s Hand” is partially set at the Pangboche Monastery in Tibet. The Monastery is mentioned in Kate Bush song “Wild Man” which is also about a Yeti. While I am a huge Kate Bush fan the story was published in 2004, my first published short story, years before the Kate Bush song. However our approaches to how we portray the Yeti are uncannily similar. The short story the “Water Dragon” from the book was reprinted in my second collection in 2017 The Wish Mechanics: Stories of the Strange and Fantastic. Due to the limited edition print runs of their books it is Dim Shores’ policy to no longer produce second printings or reprints of their titles. A repackaged edition of the book which includes an additional story is forthcoming from Crossroads Press. Your story in Nightscript III, “Palankar,” is a wonderfully chilling tale of what waits in the Palankar reef. What inspired this particular piece? The story was born from the desire to write a piece about the process of trying to help a person you love- particularly the conflict of the point when one has exceeded the safe limits and would face real peril in trying to help further. This notion was with me for a very long time before I figured out an effective story to embody it within a dramatic structure. The “surface” story is a tale of two brothers scuba diving. One of them has come to try and “help” the other by trying to convince him to come back to a family and life left behind. There is also a “submerged” story. It was my intent that the events of the story lent itself to explanations both mundane, supernatural, or psychological. With this element not being a given it was my hope that the story becomes more about the characters and their reactions to the magic and mystery of our human lives and maybe even present in roads, understandings, or awareness of mysteries larger than ourselves. I believe the supernatural or possibility of the supernatural is a potent way to explore the human condition in fiction. In the weird fiction genre the element of doubles, twins, doppelgangers and or submerged selves are often presented. It is an element I am very interested in. I think the themes these kinds of stories lend themselves to and the tension between whether characters are experiencing something natural (such as nitrogen narcosis) or something supernatural (such as monster or doppelganger), are interesting to portray and explore in fiction. As someone who has been involved in the publishing industry for a number of years now, what advice do you have for those writers who are just starting out? On the flip side, what was the worse piece of advice you were given in the early stages of your career? All of my works to date have been published with small press and micro press. So what limited experience I can report on is in that area. I think any advice or any given writers choices depends upon their individual goals and what they want out of publishing their stories. On its face that sentence seems like a given or a piece of over-generalized advice, but when one really investigates what is out there one realizes there are many models and choices to publishing a story. Each comes with benefits and drawbacks and strengths and weaknesses. I like to recommend to those seeking advice to take the time, think about, and be clear on what you want. And thinking through in advance if the benefits and drawbacks line up with what one wants and one’s goals. For example while self publishing might allow the “benefit” of bringing the story to market faster it also comes with the necessity that an author be proficient in design and marketing and accounting which could be a “drawback” to one not anticipating or desiring this part of the equation. I was fortunate enough to have a ton of great people around me when I was starting out and I was alerted to many pitfalls. The best advice is to focus on one’s writing and to control those elements that one can control. Write. Finish stories. Continue to improve one’s craft. And continue to keep your stories in front of editors is a solid model to follow. Try and steer clear of or at least reasonably manage anything (or all the things) that do not serve writing and submitting. Even if it seems like one is not getting fast results, I believe readers, editors, and publishers respond to an author’s unique style, visions and stories only they can tell. Ultimately, so advice that moves one away from the pursuit of this is bad advice in my opinion. A lot of voices out there seem to have institutionalized pursuits that on their face are in conflict with this. Unfortunately here in New York, I’ve seen bad advice thrown around from people the community expected more from–the kind of advice that hurts people and parts the innocent and unsuspecting from money and opportunity. I’ve seen new writers get hurt, discouraged, and set back as a result. Taking the time to ask questions and investigate the organizations and individuals one does business with is never bad advice. One of my next short story to published will be “Above the Buried City” in the anthology Shivers 8 from Cemetery Dance publications. At the end of 2017 I had three short stories all come out around the same time “Goodnight Kookaburra” in Walk on the Weird Side, “Cloudland Earthbound” in The Audient Void #4, and “The Fourth Bell” in The Beauty of Death Volume 2. I’m working on my third novel. The first two will be announced by the publisher very soon. I’ve also been editing anthologies for several publishers. The first one will be announced at the end of the month. Tremendous thanks to Daniel Braum for being part of this week’s author interview series. Find him online at his website and his Amazon author page. This entry was posted in Fiction, Interviews and tagged Nightscript on January 31, 2018 by gwendolynkiste. 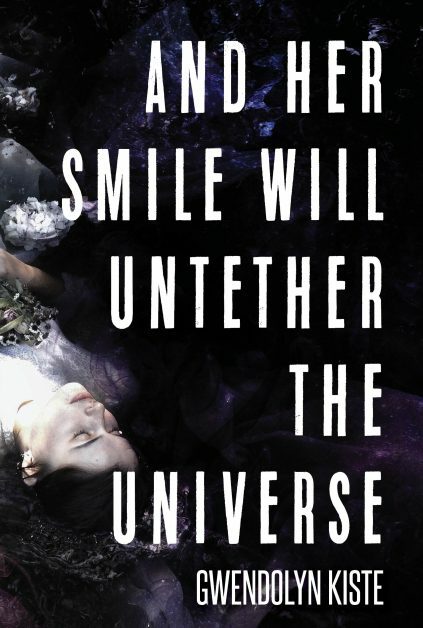 AND HER SMILE WILL UNTETHER THE UNIVERSE is on the Preliminary Bram Stoker Awards Ballot! So I’m incredibly surprised and honored to share that my JournalStone collection, And Her Smile Will Untether the Universe, made it on the 2017 Bram Stoker Awards Preliminary Ballot. Now it’s important to note that this is not a nomination, as it is only the preliminary ballot; voting on the official nominees starts this week, with the final ballot being announced in February. But to make it this far is beyond humbling and thrilling. The iMailer newsletter from HWA already went out earlier this week, which included a special link to download And Her Smile Will Untether the Universe, but just in case you missed that, it bears repeating: if you’re an Active or Lifetime member and would like to read my collection, please email me at gwendolyn@gwendolynkiste.com, and I would be thrilled to send you a copy of And Her Smile Will Untether the Universe! Good luck to everyone on the preliminary ballot! It’s an amazing roster of authors, and I’m so incredibly honored to be among so many horror creators that I admire! This entry was posted in Book Promotion, Fiction and tagged And Her Smile Will Untether the Universe on January 23, 2018 by gwendolynkiste. Welcome back for our first Submission Roundup in 2018! Lots of amazing submission calls this month, so if you’ve got a story seeking a home, perhaps one of these will be the perfect fit! As always, I’m not a representative for any of these markets; I’m merely spreading the word! That means if you have questions, please direct them to the respective publications. 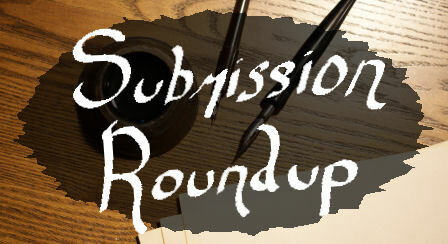 And with that, onward with this month’s Submission Roundup! What They Want: February’s theme is Un reve d’amour (A Dream of Love). Submissions should focus on love in a fairy tale or folkloric setting. Re-tellings or original stories welcome, as are experimental or traditional approaches. What They Want: Open to speculative fiction from authors from the African continent and diaspora. The upcoming issue’s theme is Big Mama Nature, and stories should focus on nature/climate fiction. What They Want: Open to novella and novel submissions. Genre should be dark science fiction, dark fantasy, or horror. What They Want: Open to strange tales in the vein of Shirley Jackson, Flannery O’Connor, Robert Aickman, Arthur Machen, and more. What They Want: Open to horror fiction as well as dark science fiction, dark fantasy, thriller and crime fiction. What They Want: Pantheon Magazine has just opened up submissions for their Gorgon issue. Open to weird, dark fiction, slipstream, magic realism, and horror based on the theme. What They Want: Kaleidotrope has just opened again to submissions. The editor is seeking well-written speculative fiction and poetry. This entry was posted in Fiction, Submission Roundup and tagged Nightscript, Pantheon Magazine on January 3, 2018 by gwendolynkiste.